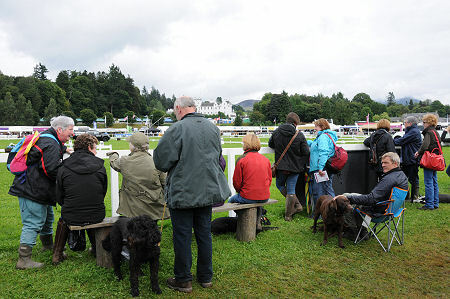 For four days each August the grounds of Blair Castle become home to the Blair Castle International Horse Trials and Country Fair. 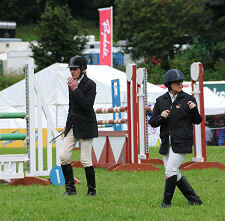 This is Scotland's premier equestrian event, and each year it is attended by some 40,000 people. Set within a beautiful natural bowl surrounded by the majestic Cairngorms, there can be few better places in which to enjoy a wide range of equestrian events, plus the country fair and large shopping village. 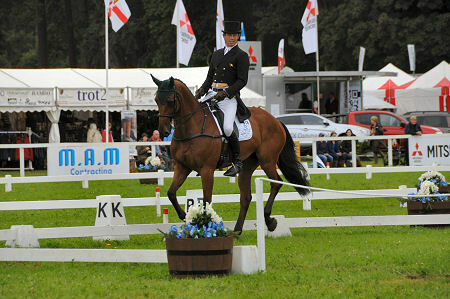 Horse trials and three-day eventing test the all round ability and stamina of both horse and rider. Typically, as at Blair Castle, the event takes place over four rather than three days, with the highly disciplined dressage element of the competition taking two days to complete. Horses and riders therefore enjoy one day of rest out of the four. 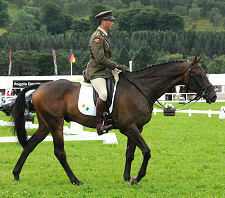 Three-day eventing has its origins in military training, being a good test of the requirements for an officer's charger. The need to be steady on parade, to be able to cross country at speed during battle and to be fit enough to fulfil duties the following day evolved into the three disciplines that make up to modern competition: dressage, cross country and show jumping. The Concours Complet International (CCI), to give its formal name, is overseen by the International Equestrian Federation (FEI) who set the standards for four levels of competition in three-day eventing, each one rated by 'stars'. To be successful 3-day eventers, riders and their horses have to be highly skilled in all three disciplines and this is a sport where Olympic medalists can compete alongside amateurs. The first three-day event at Blair Castle was held in 1989 and it was a national two-star competition. In 2012 one, two and three star competitions were held. For the dressage element competitors must ride the same set series of movements, known as the 'dressage test', between markers in an arena measuring 20m x 60m. There are different tests, varying in difficulty, for different levels of competition, and it is up to the riders to memorise the correct test for their class and know which movements to perform in which order. The routine may take as long as 7 or 8 minutes. The cross country course presents the second test. As a C*** level course, the Blair Castle cross country is some 6km long with around 29 fences, some of which are jumped twice. Horses and riders have to tackle up to 40 jumps in total. The course is designed to test the speed, stamina, boldness, jumping ability, scope and agility of the horses, and to test the rider's knowledge of pace, ability to assess and tackle fences, and their trust in their horse. With the third event, show jumping, taking place on the final day of competition, the three-day eventing is brought to its nail-biting conclusion. Jumping takes place in reverse order of merit, meaning the rider in first place after cross country penalties have been added will jump last in the final round of the competition. 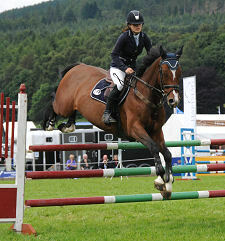 In addition to the three-day eventing competitions, Blair Castle also plays host to British Showjumping and showing classes, both of which are very popular with the crowds. 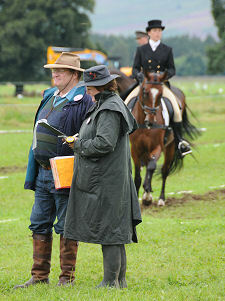 In 2012 The Bruadar Country Fair also ran alongside the equestrian activities on both the Saturday and Sunday. Featuring displays of both traditional and more modern countryside pursuits, the fair also included a tasting tent which operated over all four days. Bruadar is one of the flagship brands for The Scottish Liqueur Centre, based at Bankfoot, Perthshire and it markets a liqueur produced by adding honey and sloes to single malt whisky. The trade stands that surround the dressage and jumping arenas provide a huge range of eating, drinking and retail opportunities. 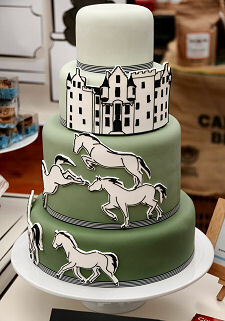 In 2012, the Food Fair included representatives from Edinburgh Gin, The Crusty Pie Company, Sucre Coeur celebration cakes, Saladworx and the Aberdeen Fudge Company amongst many others. Visitors had the opportunity to both sample and purchase the mouthwatering items on offer. Among the retailers present were those whose products had a specific equestrian appeal such as Alexanders Horse Boxes, Baileys Horse Feeds, Coltsfoot Equestrian and Diamond Saddlery Ltd.; as well as countrywear suppliers such as Dubarry, Craft Fox Clothing and Joules; plus jewellers, artists, fishing and shooting retailers and much much more. The weather wasn't always kind in 2012, but the Blair Castle Horse Trials made for a great day out, or series of days out, whether your interest was purely equestrian or you were simply looking for a fun time with the family or friends with some retail therapy thrown in!